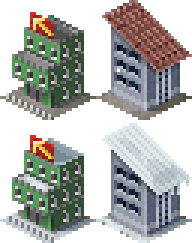 EN: Some small industrial buildings on 1x1 for more variety in the city. Includes graphics for winter time. DE: Einige kleine Industriegebäude auf 1x1 für mehr Abwechslung in der Stadt. Inklusive Grafik für die Winterzeit. Last edited by theotheoderich on Sat Feb 25, 2017 12:14, edited 1 time in total. 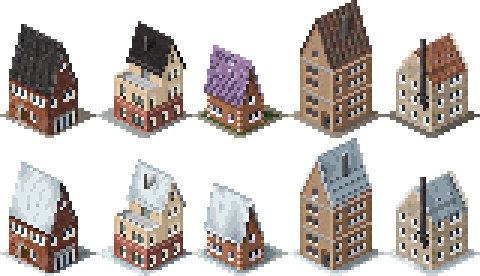 EN: Level Ͳ and level ͲͲ residential buildings on one tile. Includes graphics for winter time. DE: Level Ͳ und level ͲͲ Wohngebäude auf jeweils einem Feld. Inklusive Grafik für die Winterzeit. EN: Level Ͳ and level ͲͲ commercial buildings. Includes graphics for winter time. DE: Level Ͳ und level ͲͲ gewerbliche Gebäude. Inklusive Grafik für die Winterzeit. The Arcade Games Center is animated. 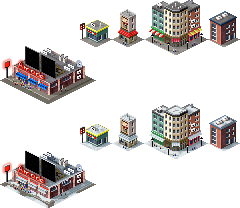 Unfortunately, the GIF format can not display partial transparent pixels, so it will look slightly better in the game than in this picture. Last edited by theotheoderich on Fri Feb 24, 2017 23:38, edited 1 time in total. EN: Barber shop for level Ͳ on one tile. Includes graphics for winter time. DE: Level Ͳ Frisörladen einem Feld. Inklusive Grafik für die Winterzeit. 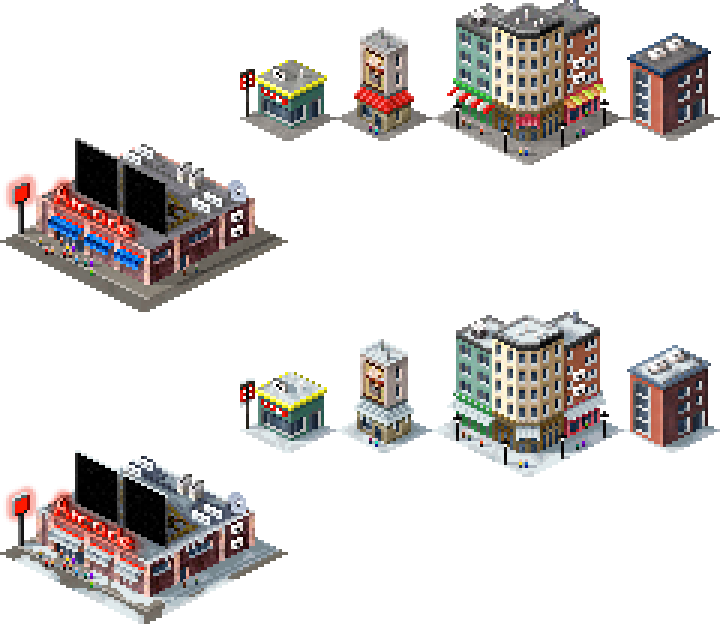 EN: Some small commercial buildings on 1x1 for more variety in the city. Includes graphics for winter time. DE: Einige kleine Gewerbegebäude auf 1x1 für mehr Abwechslung in der Stadt. Inklusive Grafik für die Winterzeit.